1-UP Studio - formerly Brownie Brown - has been relatively quiet in recent times, though it has been contributing to some Wii U and 3DS releases, including The Legend of Zelda: Tri Force Heroes; in fact, its social media posts for much of last year were mostly focused on graduate seminars and recruitment. A Facebook post this week, however, has fans dreaming of Mother 3 on Nintendo Switch, following the recent revisiting of rumours that it'll come to the Virtual Console in the West; it actually arrived on the Wii U in Japan in late 2015. If Nintendo is going to put this ongoing demand (again, in the West) for the GBA title to bed, doing so on new hardware would be a smart way to fire up some of the company's biggest fans. 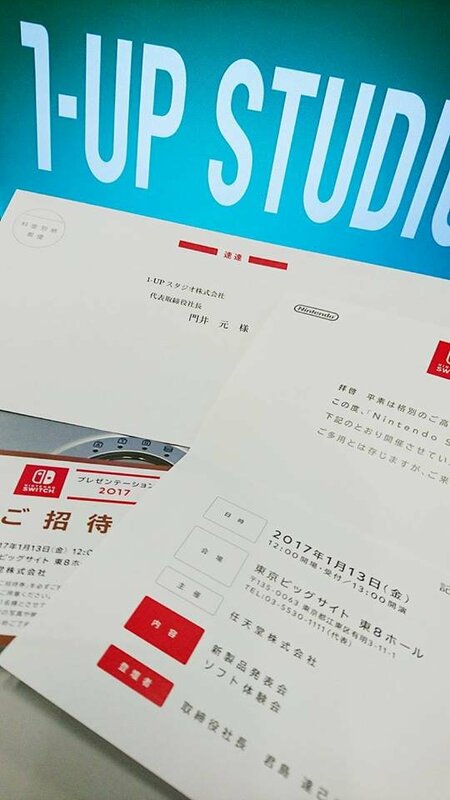 That post on Facebook simply shows what seems to be a Switch invite, with the message saying (roughly translated) that it should be 'an interesting year with new stuff coming to the world'. Of course, 1-UP Studio is a fully owned subsidiary of Nintendo, so it's hardly surprising that it'll be attending Switch events next week. That said, posts like this do boost hopes for that Mother 3 release or, perhaps, a new project in which the company's involved. All should become clear on 12th / 13th January. Still skeptical that it will come to the west, and this doesn't really prove anything. I would definitely buy it if it came out on the Wii U, but it might be a while until I get a Switch. I'm sure that Mother 3 is coming to the West! If we never get another Mother, at the very least they could do is give us a remake of Earthbound. There could be so many possibilities with a remake of Earthbound! does this mean fire emblem 1-6 and 12 are getting localized? As I said before, the late Virtual Console arrivals are purposefully held back with a release rate of one per generation - Europe got Super Mario RPG with the Wii, the Wii U saw the rerelease of Donkey Kong 64 and EarthBound, and now the Switch sees the release of Mother 3 internationally. If Nintendo really saves certain games for whenever a threshold situation pops up, let those games at least be new games. Old games are not system sellers, and they shouldn't be treated as such. It's as likely about Half Life 3. @AlexSora89 I too wonder if Nintendo really believes VC games can act as system sellers. Earthbound /Mother 2 was promised to be released on the original Wii! Now we finally got Earthbound and Beginnings and presumably no Wii U was sold because of it. Meanwhile, the Wii U GBA VC is already there put in place waiting for Mother 3, you know. Of course, if it ends up with an international release on Switch, some Nintendo representative will try to tell us it the Wii U was not powerful enough to run such a demanding game. @AlexSora89 "late Virtual Console arrivals are purposefully held back with a release rate of one per generation"
Even if that was true, it doesn't male a lick of sense to me. If a possibility, great. Mother IV would be much, much more exciting however. @Moshugan It doesn't make sense to us, but it is precisely the kind of twisted logic Nintendo tends to operate on. @Pazuzu666 I think Shigesato Itoi himself said once that Mother 4 was not something that made sense to him. He was pleased with the trilogy story arc. Wait, how does this point to Mother 3 in the slightest? It kind of sounds like you guys are grasping at straws. @Pazuzu666 that's not gonna happen unless they get someone else to write the story for them and at that point they may as well make something entirely new. Itoi is done with the series and that's only a good thing. There's enough authors out there who run their stories into the mud because they feel obligated to make more just because a bunch of annoying kids want them to. What if they release a trilogy for Switch, with Earthbound Begginings, Earthbound and Mother 3? I mean, there are too many rumors lately pointing to Mother 3's impending localization... Its too much to be merely coincidence. @Nintendoer @Dakt The only reason this might point to Mother 3 is the fact that this studio made Mother 3 when they were still called Brownie Brown Inc. I'm guessing that you guys must be counting down the days until the Switch games reveal when you will actually have something to write about again. Filling pages on a website when there is nothing to actually discuss/preview/review must get frustrating. I think you guys are going a bit overboard with the way you post these rumors. Brownie Brown/1-UP Studio has worked on much more than MOTHER 3, so this could be anything really. Would be great if it was released at launch. I like the idea someone else said on here yesterday, that the switch will be like a GBA on steroids. I really like that idea. Why would they be hinting at Mother 3 in Japanese when it's already available on the VC in Japan? Makes no sense. What I'm more interested in is, will Nintendo finally get the Virtual Console right with the Switch? As much as would like to see Mother 3 on the VC, I have doubts that it'll be coming to the US. But who knows? Nintendo is the company to expect or unexpect. Don't care about the Mother series at all. But awesome for those that have been waiting for it! It doesn't make sense to me, but that would add to the heap of nonsensical choices Nintendo has made so far. @Sakuraichu we kind of got 1/3 with shadow dragon. 2 was like many NES direct sequels (adventures of link, Mario USA), very different. Would love to see 4-6 localized though. Six should be a no brainer because Roy and Smash. And 4-5 are the best games of the series. And hey, while we're at it, not enough people played 9/10. And by the time these three have all been re released as super games, Fates could be due for its remaster with all three games included. Sounds like lack of news has left N--Life jumping at the guns to post just about anything about everything. Hope Nintendo gives you some good job security next week or things could really disappoint from here on out. ...So at this point, if there's no announcement during the NS stream, the fabled MOTHER 3 re-release is basically Nintendo's Half-Life 3. Darn, why is it always the third one? I hope this happens, just give it an M rating if censoring is the problem. People will still download at this point. lol Nintendo will keep this whole mother 3 thing going for at least another 5 years. When the switch is about to retire, they'll release it on its virtual console and be praised for it. I'm not holding my breath, but if Mother 3 does come to the west on Switch, then I'm getting a Switch as soon as I can. Okay, so I mean, I get why some people would think that bringing an article up like this is grasping at straws, but I have to wonder if it would be reported if not for the rumors around Mother 3 for the past few months. Like, I feel that this is worthy of bringing to people's attentions in this scenario since Mother 3 has a lot of talk about it at the moment. If we had not heard anything regarding Mother 3 for years (no JP VC release, no rumors, no E32014 Mother 3 joke, etc) then I would see this as grasping. But I feel like everything's been leading up to a Mother 3 release for a bit now. Not gonna happen my friend...just wont. from someone who used to watch ESPN religiously, me likes!! I don't see what makes this a Mother 3 indicator? The article says that the message roughly translates "an interesting year with new stuff coming to the world." How is a decade-plus old game supposed to be new? I think this is reaching for a straw. By all logic, it's just as possible we're getting a port of the Professor Layton city life game they made with the 3rd Layton. I would do terrible things to see an Earthbound remake using assets from Smash 4. Onett in HD just fits so well. That would be so amazing and honestly I would prefer something like that to getting Mother 3 on VC. I just hope this happens so that people can finally shut up about it! Talk about a broken record shesh! Hopefully the missing VC games will see a rerelease "as soon as possible", and not "only in case the system is struggling to sell". Seriously, Mother 3 really is one of the greatest games ever made, imo, and one of the most important too. "New stuff coming to the world." Mother 3 was rereleased various times in Japan on multiple platforms. Instead, we may see another game from the studio. I'll believe it when I see it though I do hope it comes here finally. Sometimes I swear Nintendo pulls projects when they get leaked. "Credible" sources have been prophesying Mother 3's release for years now. I feel like Nintendo keeps shelving the project until it's least expected. You never know! Kid Icarus came also out of retirement after all. Got a point on that, we all can only dream. @Professor_Clive I only recall the December, 2015 re-release on Wii U Virtual Console in Japan.